Inspiration has never been in short supply when it comes to my creative process and I always have an abundant flow of good ideas for things to create. However, the time and energy to put all of these in the works is another story completely! This started as early as college when I had pages in my sketchbook of ideas that never happened. I’m always left disappointed at opportunities missed and the sad reality that the time in each day is finite. 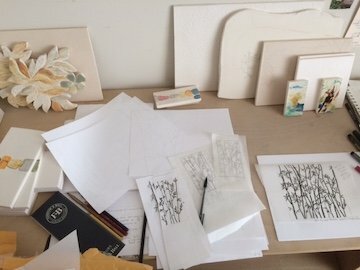 I also - in every one of my studios - have always had several partially finished pieces lying around waiting for the time to finish them. 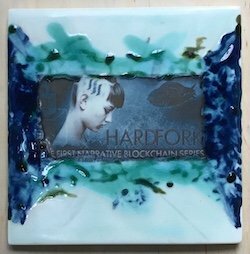 Last year I was really excited to make some swag for the @Hardfork-series . This is a project that fired me up from the beginning. I love that @ericvancewalton, @dougkarr, Matt Neimerg, @skycorridors, @bakerchristopher and their team took the leap to carve out a new way to create a narrative film mini-series powered by blockchain and dealing with decentralized themes. This disruptive method is groundbreaking to say the least. It has the potential to empower the whole creative process behind the project and can open doors for others trying to get their ideas out there with fewer obstacles and more creative freedom. The source of funding for a project makes a huge difference. Another source of inspiration for me was the artwork @opheliafu so prolifically produced from the chapters of the @hardfork-series script. She would post these incredible drawings on the Hardfork Slack channel several times a week and each time I saw them I felt an internal nudge to think of ways I might be able offer something to the project. Her images also helped make the story come to life for me. I like sci-fi just fine but it’s never been a genre that I seek out, so her artwork jump started my imagination and made me warm to the story more easily. In the interest of supporting this team and their project I decided that maybe I could make something that could be used as gifts for generous donors or to help raise funds both through posting about the process and the sale of the items. 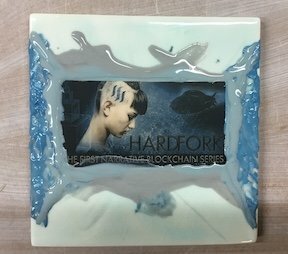 Needless to say, all author rewards from the post will be donated to the @hardfork-series project, better late than never!! My idea was to create some tiles that could be both decorative and useful - coasters, hotplates and maybe some wheel thrown mugs. The Hardfork team provided me with one of their images so I could start with a little experimenting. I had this image printed as a special type of transfer intended for a glazed ceramic surface. I made the tile, bisque fired it and then put a coat of white glaze down and fired it again. Next I transferred the image on to the tile. It works kind of like a temporary tattoo where you immerse it in water, separate it from the backing and place the image on the tile. At this stage, I just wanted to see what happened if I put some colors over and around the image. Would the imagery come through? Which colors work? Here are 2 rounds of glazing and firing. This was as far as I got. As so often happens for me, orders came in with short deadlines and I needed to turn my attention to those and @hardfork-series swag development was put to the side. In this case, I went from super busy finishing work to super busy preparing to move since my X-country move was looming. My attention and time never opened up again. Here I am a year later unpacking this first attempt at a Hardfork support tile. Such a bummer that I wasn’t able to make this happen last spring, but I did at least have enough hope behind it to bring it across the country with me!! Thanks Steemians for your support, friendship and all the ways you contribute to this platform! Wow, very cool! And I love to see your process, as well. I'm amazed there are transfers like that, that will survive the heat of a firing without... disintegrating. I suppose it's not a stretch, as I have seen corporate logos and such put on tiles and mugs... but still. Very creative! Beautiful combination of transfer and glaze. I've been experimenting with some new images based on some HF set photographs Doug sent me, but so far I have not been happy with any of my creations. Thanks, this was just a start, I'd hoped to go further but it is what it is. I look forward to seeing your images! I'm sorry I'm only seeing this two days later @natureofbeing but I sort of took two days off being online a bit. I have to be careful as it is so easy for me to want to just wander away from the digital world. Luckily Steemit does always bring me back. I love posting and commenting here, but sometimes even that makes me feel anxious, as if I"ve not enough time to get to all the blogs I love. Add to that all the other social media I am 'supposed' to be doing (but almost never do :/ ) and there you go. I love these tiles. The one with the warm red tone is my favourite. I hope you are getting some work time in for YOU as well as your orders and getting some snowy walks in with your darling doggy. Ha I completely understand how easy it is to wander away from the digital world and also how steemit has a way of drawing us back (thankfully!). Glad it's going well and yes after all of those logistics I can imagine recovery time is in order! I have to up your comment coz I am late as always. Very cool work you put in place. thank you and no worries about being late, I always look at comments no matter how old. Yesterday I left a comment on a post from 4 months ago! This is phenomenal @natureofbeing! I can’t tell you how much your support means to us. Thank you so very much for your creativity and friendship! WOW! These are SO awesome!!! The inspiration is mutual!! So cool! Keep up the great work!! 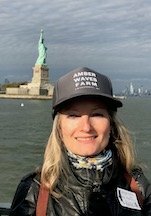 BTW, I'm near NYC now, so when you guys want company for a beer break please reach out! Always amazing to see your artwork, @natureofbeing... You have such a unique and incredible creativity !!! You are very kind, thank you so much for your support, it means a lot! great, thank you and I look forward to it! I hear you about time being finite, what a bummer. Great work, so good to see what you are up to. I have been thinking of you. thanks @edouard, we all seem to hit up against time limits don't we?!! I like reading and looking at your post, Ruth. Sometimes you show us how you create your art, even after all these times, it looks like magic to me still. The tile looks different than your normal art, this one feels more modern and grungy. Pretty cool :). fun to have the chance to branch out.